So I got Adorkable based on impulse, and I got it because I was curious with Sarra Manning books. I haven’t found copies of her adult contemporary romances just yet, so I settled for her YA book and one that seemed to be something I would like. Jeane Smith is a blogger and she basically runs her own life with her own brand of quirky style. This makes her quite unpopular, especially with her strong opinions on things, which puts her on the other end of the spectrum from popular boy Michael Lee, who she can’t really stand. When Jeane’s ex-boyfriend and Michael’s ex-girlfriend get together, it was the only thing that they share in common. But is that enough for them to…well, start snogging? Apparently, it is. So Adorkable. I liked how clear Jeane and Michael’s voices were that even if there were no clear chapter headings or style changes every time a chapter changes, I know who’s speaking. I liked the idea that Jeane makes a living as a blogger (possibly enough to get her one of the homes for sale outer banks if she wanted to) and how she speaks to so many people about her own brand and how she has become the voice of the teens. There were so many fun things in this novel that I can’t help but smile and wonder why those things didn’t happen back when I was Jeane’s age. I could’ve been one of those blogging superstars too, you know? :P There were also many laugh out loud moments, in the book and “awww” moments, especially during that Christmas scene with the Lee family and…well, basically anything that involved Michael because he is kind of adorable. But…my like for this book kind of ends there. I really wanted to like this book, but somehow most of it just kind of got on my nerves. I think it came to a point when I realized that I was one of those kids that Jeane would be annoyed at if I were in high school with her. I don’t follow trends blindly nor go and be mean on purpose to some classmates that I don’t like, but I feel like I’m not dorky enough to pass by Jeane’s standards. And somehow that made me feel like I’m in the wrong despite the fact that the book was promoting being comfortable with yourself. Maybe Jeane is just not the person I would be friends with if I was back in high school. I’d like to believe that I won’t be judging, but knowing my high school self, I probably will. There were times when I enjoyed and admired Jeane, but I think there were more times when I was just exasperated with her, and I wondered what would be her undoing. Sometimes I think she was trying hard to be too radical and dorky, and I just got so annoyed a how she pushed everyone away. But maybe that’s the point of that, and the point of the story with how she changed. Still, I felt that when that turning point finally came, it was too late for me to start liking Jeane again. I get all the empowerment with being yourself and daring to be different, but here’s the thing: do you really have to be in everyone’s faces and think who doesn’t dress or think like you so you can be adorkable? Nah. 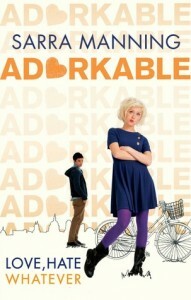 Adorkable is cute, but I think it’s not my kind of book. Aww Tina, I’m sorry to hear this. I’ve always wanted to try Sarra Manning’s YA contemp, but the more I read reviews like this, the more my suspicions that she’s a better adult author are confirmed. Even though it didn’t work for you, thanks for the review!